Followers of the USPTO’s updated patent eligibility guidance issued this past July will note that the PTO rebuffs the calls for examiners to provide evidence proving up any assertion of an abstract idea. The Office places great weight on the fact that in the Bilski case no evidence of an abstract idea was provided to the US district court. The Office reasons therefore that the appellate courts — which are charged with merely reviewing the record below — could not have based their Bilski decisions on any evidence of an abstract idea. Here is a link to an interesting article that describes the ways that new evidence can be considered on appeal: [Link]. 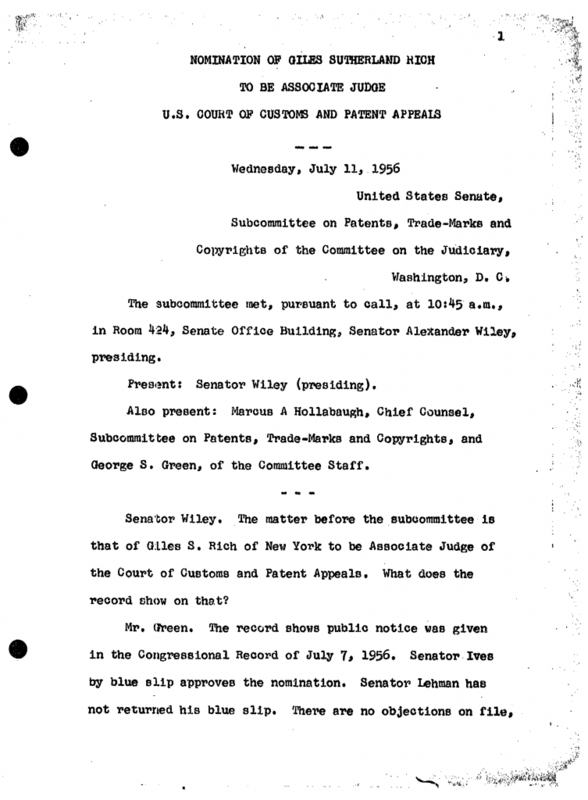 I was poking around on Westlaw the other day and ran across materials related to Judge Giles Sutherland Rich’s confirmation proceedings when he was appointed to the Court of Customs and Patent Appeals by President Eisenhower in 1956. These materials are from witnesses, rather than testimony from Giles Rich himself. I’m not sure if he was not required to testify or if my search method was flawed; but, I did not locate any actual testimony by Judge Rich in regard to his nomination. The witnesses’ testimony is available here: [Link]. To this day, the Federal Circuit still discusses opinions that Judge Rich wrote for the court, as this sound bite from the oral argument of Alps South, LLC v. Ohio Willow Wood Co. illustrates: [Listen]. It is well-established that “whether the asserted claims … are invalid for failure to claim statutory subject matter under 35 U.S.C. § 101, is a question of law which we review without deference.” AT & T Corp. v. Excel Commc’ns, Inc., 172 F.3d 1352, 1355 (Fed.Cir.1999). As a question of law, lack of statutory subject matter is a “ground [for affirmance] within the power of the appellate court to formulate.” Chenery, 318 U.S. at 88, 63 S.Ct. 454. While there may be cases in which the legal question as to patentable subject matter may turn on subsidiary factual issues, Comiskey has not identified any relevant fact issues that must be resolved in order to address the patentability of the subject matter of Comiskey’s application. Moreover, since we would review a Board decision on the issue of patentability without deference, see AT & T, 172 F.3d at 1355, the legal issue concerning patentability is not “a determination of policy or judgment which the agency alone is authorized to make.” Chenery, 318 U.S. at 88, 63 S.Ct. 454. Whether asserted patent claims are invalid for failure to claim statutory subject matter under § 101 is a question of law. See In re Comiskey, 554 F.3d 967, 975 (Fed. Cir. 2009). However, “determination of this question may require findings of underlying facts specific to the particular subject matter and its mode of claiming.” Arrhythmia Research Tech. Inc. v. Corazonix Corp., 958 F.2d 1053, 1056 (Fed. Cir. 1992). Therefore, because a patent is presumed to be valid pursuant to 35 U.S.C. § 282, a party must prove the factual elements of ineligibility by clear and convincing evidence. See Island Intellectual Prop. LLC v. Deutsche Bank AG, No. 09 Civ. 2675 (KBF), 2012 WL 386282, at *2 (S.D.N.Y. Feb. 6, 2012); Voter Verified, Inc. v. Election Sys. & Software, Inc., 745 F. Supp. 2d 1237, 1251 (M.D. Fla. 2010) (“A patent is presumed valid, and [defendant] bears the burden to prove the factual elements of invalidity under 35 U.S.C. § 101 . . . by clear and convincing evidence.”). SINCLAIR-ALLISON, INC. v. FIFTH AVENUE PHYSICIAN SERVICES, LLC, No. CIV-12-360-M (W.D. Okla. Dec. 19, 2012). While the question of whether a claim is directed at patent-eligible subject matter is one of law, that determination will often entail the resolution of underlying factual questions. VS Techs, LLC v. Twitter, Inc., 11 CV 43, 2012 WL 1481508, at *4 (E.D. Va. Apr. 27, 2012) (addressing Section 101 and noting that although the ultimate question of validity of patent is a question of law, “there may be underlying factual questions that the jury must answer”) (citing Arrhythmia Research Tech., Inc. v. Corazonix Corp., 958 F.2d 1053, 1055-56 (Fed. Cir. 1992)); see also Microsoft Corp, 131 S. Ct. at 2242-43 (“While the ultimate question of patent validity is one of law, the same factual questions underlying the PTO’s original examination of a patent application will also bear on an invalidity defense in an infringement action.”) (internal marks and citations omitted); Bancorp Servs., L.L.C. v. Sun Life Assurance Co. of Canada (U.S.), 687 F.3d 1266, 1273-74 (Fed. Cir. 2012) (“it will ordinarily be desirable—and often necessary—to resolve claim construction disputes prior to a § 101 analysis, for the determination of patent eligibility requires a full understanding of the basic character of the claimed subject matter”). Courts accordingly have declined to decide the issue of patent eligibility as a matter of law (i.e., prior to fact-finding or claim construction) when the issue depends upon the resolution of a factual dispute. See Card Verification Solutions, LLC v. Citigroup Inc., 13 CV 6339, 2014 WL 4922524, at *5 (N.D. Ill. Sept. 29, 2014); Genetic Techs. Ltd. v. Glaxosmithkline, LLC, 12 CV 299, 2014 U.S. Dist. LEXIS 156473, at *2-4 (M.D.N.C. Aug. 22, 2014); see also VS Techs, 2012 WL 1481508, at *4. Cf. Data Distrib. Techs., LLC v. Brer Affiliates, Inc., 12 CV4878, 2014 WL 4162765, at *5-6 (D.N.J. Aug. 19, 2014) (citing cases and noting that courts have adjudicated patent eligibility prior to claim construction where there are no factual disputes, there was no reasonable construction that would bring claims within patentable subject matter, or the construction most favorable to the patentee are still patent-ineligible). PROTOSTORM, LLC v. ANTONELLI, TERRY, STOUT & KRAUS, LLP, No. 08-CV-931 (PKC)(JO) (E.D.N.Y. June 5, 2015). Patentability is a question of law “that may be informed by subsidiary factual issues.” CyberFone 885 F.Supp.2d 710, 715 (D.Del.2012) (citing In re Comiskey, 554 F.3d 967, 976 (Fed.Cir.2009)). WIRELESS MEDIA INNOVATIONS, LLC v. MAHER TERMINALS, LLC, Civil Action No. 14-7004 (D.N.Y. Apr. 20, 2015). Patentability under Section 101 is a “threshold inquiry” and a question of law. In re Bilski, 545 F.3d 943, 950-51 (Fed. Cir. 2008), aff’d, Bilski v. Kappas, 561 U.S. 593 (2010). Yet this question oflaw is also one that “may be informed by subsidiary factual issues[. ]” CyberFone Sys., LLC v. Cellco P’ship, 885 F. Supp. 2d 710, 715 (D. Del. 2012) (citing In re Comiskey, 554 F.3d 967, 976 (Fed. Cir. 2009)). EXECWARE, LLC v. BJ’S WHOLESALE CLUB, INC., Civil Action No. 14-233-LPS (D. Del. July 15, 2015). Patentability under Section 101 is a “threshold inquiry” and a question of law. In re Bilski, 545 F.3d 943, 950-51 (Fed. Cir. 2008), aff’d, Bilski v. Kappas, 561 U.S. 593 (2010). Yet this question of law is also one that “may be informed by subsidiary factual issues[. ]” CyberFone Sys., LLC v. Cellco P’ship, 885 F. Supp. 2d 710, 715 (D. Del. 2012) (citing In re Comiskey, 554 F.3d 967, 976 (Fed. Cir. 2009)). TRIPLAY, INC. v. WhatsAPP INC., Civil Action No. 13-1703-LPS (D. Del. Apr. 28, 2015). In support of its argument, Plaintiff cites two Federal Circuit cases for the proposition that “whether a patent claim is directed to statutory subject matter is a question of law.” Prometheus Labs. Inc. v. Mavo Collaborative Servs., 628 F.3d 1347, 1353 (Fed. Cir. 2010); see also In re Comiskey, 554 F.3d 967, 975 (Fed. Cir. 2009) (“It is well-established that `whether the asserted claims . . . are invalid for failure to claim statutory subject matter under 35 U.S.C. § 101, is a question of law which we review without deference.”). The language cited by Plaintiff merely articulates that the ultimate question of the validity of a patent is considered to be a question of law. However, Plaintiff ignores the fact that there may be underlying factual questions that the jury must answer in order to reach a conclusion on validity. See Arrhythmia Research Tech., Inc. v. Corazonix Corp., 958 F.2d 1053, 1055-56 (Fed. Cir. 1992) (“Whether a claim is directed to statutory subject matter is a question of law. Although determination of this question may require findings of underlying facts specific to the particular subject matter and its mode of claiming, in this case there were no disputed facts material to the issue.”). Thus, where the issue of validity depends upon the resolution of a factual dispute, a jury is permitted to decide the issue. Once the underlying questions of fact are answered by the jury, the validity issue is resolved. Further, the language of the cases cited by Plaintiff merely reaffirms the fact that the issue of validity is reviewable on appeal de novo, like any other question of law. It does not, however, stand for Plaintiffs assertion that the jury should not have been asked to decide this issue. The issue of validity is no different than any other question of law that is answered by the jury because of the issue’s dependence upon the resolution of a factual dispute. For example, the ultimate determination of obviousness is also a question of law but is “based on several underlying factual findings, including (1) the scope and content of the prior art; (2) the level of ordinary skill in the pertinent art; (3) the differences between the claimed invention and the prior art; and (4) evidence of secondary factors, such as commercial success, long-felt need, and the failure of others.” Retractable Techs., Inc. v. Becton. Dickinson & Co., 653 F.3d 1296, 1310 (Fed. Cir. 2011). The issue of validity is no different. As the Court acknowledged in its October 5, 2011 Order, it could not conclude as a matter of law that the patent was not abstract because of a factual dispute over whether a machine is involved in the process, that process being the “taking [of] raw information and putting it into a format which enables people who are knowledgeable or skilled in a particular area to interact with others and discuss relevant topics in their particular field.” Doc. 99 at 10-11. As the issue of validity depended upon the resolution of this factual dispute, the question properly fell within the province of the jury. VS TECHNOLOGIES, LLC v. TWITTER, INC., Civil Action No. 2: 11cv43 (E.D. Va. Apr. 26, 2012). Whether the asserted claims are invalid for failure to claim statutory subject matter is a question of law that may be informed by subsidiary factual issues. See In re Comiskey, 554 F.3d 967, 976 (Fed.Cir.2009) (citations omitted). Cyberfone Systems, LLC v. Cellco Partnership, 885 F. Supp. 2d 710 (D. Del. 2012). “The MPEP [is] commonly relied upon as a guide to patent attorneys and patent examiners on procedural matters. . . .” Litton Sys., Inc. v. Whirlpool Corp., 728 F.2d 1423, 1439 (Fed. Cir. 1984). Although the MPEP does not have the force of law, it is entitled to judicial notice “so far as it is an official interpretation of statutes or regulations with which it is not in conflict.” Id. Here, the MPEP is consistent with the statutory scheme and § 1.948(a)(2). MPEP § 2666.05, titled “Third Party Comments After Patent Owner Response,” pertains to § 1.948(a)(2) and the limitations on submission of prior art by the third-party requester after the order for inter partes reexamination. According to § 2666.05, “any such new proposed rejection stands on the same footing as a proposed rejection presented with the request for reexamination.” MPEP § 2666.05 (2008). Section 2666.05 continues, citing MPEP § 2617 for “the required discussion of the pertinency of each reference,” and directing that “[a]n explanation pursuant to the requirements of 35 U.S.C. [§] 311 of how the art applies is no less important at this stage of the prosecution, than it is when filing the request.” Id. The Federal Circuit is Coming, The Federal Circuit is Coming . . . .
Pursuant to 28 U.S.C. § 48, six panels of the Federal Circuit Court of Appeals will hear oral arguments in Boston, Massachusetts, on October 6 through 8, 2015. In accordance with routine practice, the names of the panel judges will not be released prior to the morning of scheduled arguments. You are currently browsing the 717 Madison Place blog archives for August, 2015.